Champ's The World's Finest Selection of Clocks! Imagine the sustained sound of 1000 synchronized clocks chiming the Noon Hour together at once! 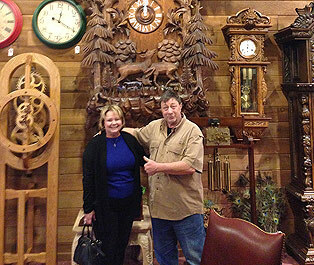 Our 14th Annual Chiming Event to Celebrate the onset of Daylight Savings Time and to Share our Selection of fine clocks with you . It begins with the gentle ticking of majestic Grandfather Clocks, wagging tails and eyes of classic Kit-Cat clocks and suddenly the first Cuckoo calls from a distance. The rich gongs, bells, and chimes begin to swell with an added blend of musical animated and nostalgic tones of time telling history, slowly filling the room. 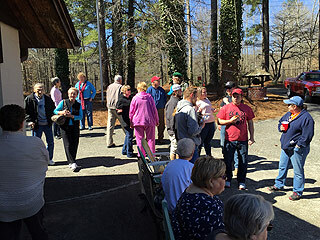 If you still are having a hard time with your imagination, treat yourself to reality at our annual Chimes of 1000 clocks event. Its a euphoric symphony of nostalgia for your Ears. Your eyes will thank you too. Swinging pendulums, cuckooing birds and animated treats in every direction. Champ's is the only place in the world that you can hear a thousand clocks chiming at once. 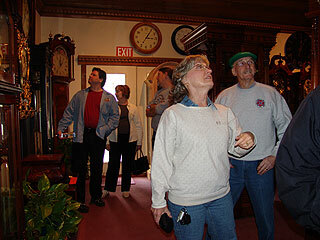 Our staff will spend the better part of a week winding and synchronizing the time on our clocks for one great day filled with chimes that is truly a one of a kind experience. This event is always a media circus of camera flashes, video making and the joining of clock lovers. You will have ringing in you ears when Sharon Rings the 34" 800 pound McShane Church bell. Bring your friends, family, your cameras and maybe Ear Plugs. 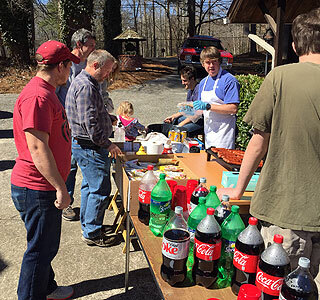 Don't worry about lunch, It's on us, with Free Hot Dogs and Coke products while they last. Car and Bike Clubs welcome. Let us know your coming and we'll leave space for you to Set up early and show your pride and joy. For those that can not make it on Saturday, You will experience Hundreds of clocks chiming all through the shop towards the end of the week prior to the event. REMEMBER TO SET YOUR CLOCKS AHEAD SATURDAY NIGHT AFTER THE EVENT! 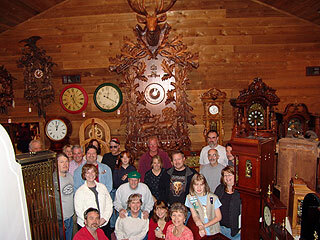 In March 2007 we were to celebrate our 40th Anniversary. 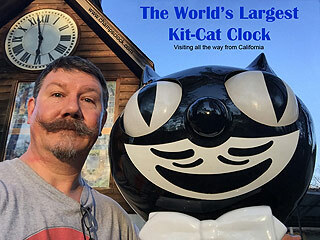 We wanted to do something special and came up with the idea that clock enthusiast might like the experience that even we, here at the shop had never experienced. 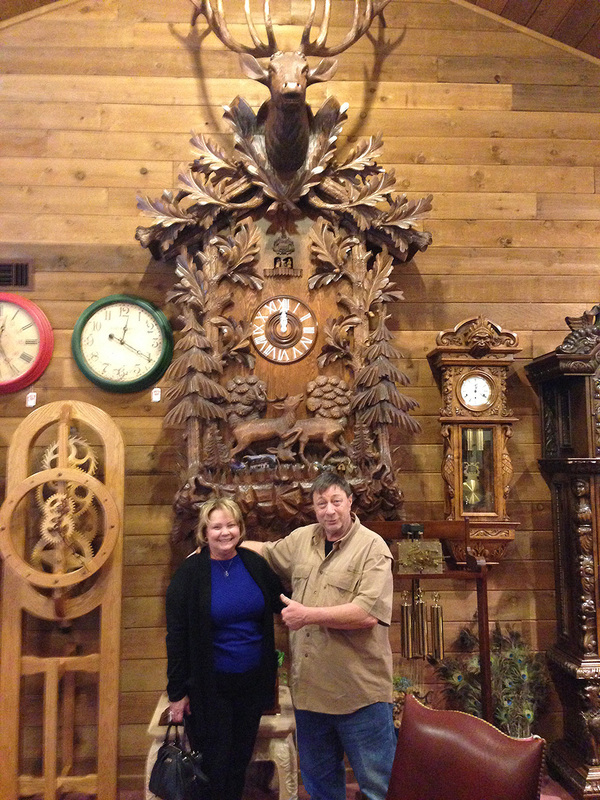 Every clock in the shop running and chiming. ALL OF THEM! It was better than expected. Overwhelming! Chills of excitement with tears of joy. Something no one had ever heard before. 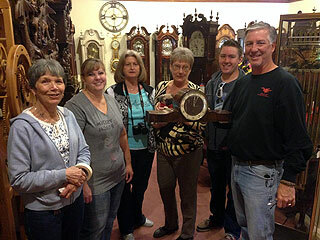 Clocks bring SMILES to young and old! A hand wound clock is a nostalgic link to our past with its gentle tic-toc sounds and rich counting of the hour chimes, they are truly the heartbeat in the home. The tradition of winding your clock on Sunday morning makes memories for your future generations. "The World's Largest Kit Cat Clock"
was here for our 2016 & 2017 chiming event, but has now gone home :-( . He enjoyed all the selfies & seeing you TOO!